Historians have described it as the trial that led to the birth of the modern world. 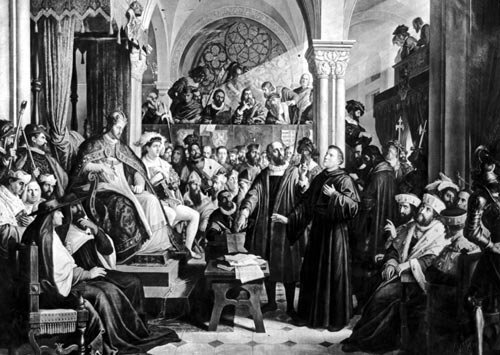 Before the emperor of the Holy Roman Empire and the Diet of Worms in the spring of 1521, as Luther biographer Roland H. Bainton noted, “the past and the future were met.” Martin Luther bravely defended his written attacks on orthodox Catholic beliefs and denied the power of Rome to determine what is right and wrong in matters of faith. By holding steadfast to his interpretation of Scripture, Luther provided the impetus for the Reformation, a reform movement that would divide Europe into two regions, one Protestant and one Catholic, and that would set the scene for religious wars that would continue for more than a century, not ending until the Peace of Westphalia in 1648. Martin Luther’s long journey to Worms might be said to have begun in 1505 on a road near his home town of Erfurt in Saxony (now part of Germany), when a bolt of lightening knocked Luther to the ground. Luther took the lightening to be a call from God, and–to the disappointment of his father, who hoped he would become a lawyer–, took vows at an Augustinian monastery to begin a profoundly Christian life. Luther impressed his superiors at the Erfurt monastery. By 1507, he was an ordained priest and had offered his first mass. By 1508, he had earned a degree in Biblical studies from the University of Wittenberg and become an instructor at that Augustinian institution. Those early doubts concerning Rome and its ways would blossom over the next several years after Luther earned the prestigious post as Doctor of the Bible at Wittenberg University and undertook a thorough review of the source book of his religion. Luther’s study led him to the theology of Paul and his belief in the possibility of forgiveness through faith made possible by the crucifixion of Christ. In Paul’s theology, which Luther would largely adopt as his own, there was no need to look to priests for forgiveness because, to those who believed and were contrite, forgiveness was a gift of God. Luther’s understanding of Paul’s theology led him to view skeptically the Catholic Church’s reliance on the practice of selling indulgences as its major source of revenue. (An indulgence was a remission of temporal punishment after a confessor revealed sin, expressed contrition, and made the required contribution to the Church.) In sermons in Wittenberg beginning in 1516, Luther argued that forgiveness came from within, and that no one–whether a priest or a pope–was in position to grant forgiveness because no one can look into the soul of another. He also questioned whether the pope could, as he claimed, deliver souls of a confessor’s dead loved ones from purgatory. By lashing out at the sale of indulgences, Luther was striking at the heart of the Church’s array of money-raising tools and confrontation was inevitable. Luther, in an angry response to the indulgence sales campaign, prepared in Latin a placard consisting of ninety-five theses for debate. The placard, in accordance with the custom of the time, was placed upon the door of Wittenberg’s Castle Church . The power of pardon, Luther contended in his Ninety-Five Theses, was God’s alone. If, indeed, the pope had the power he claimed, Luther asked why he didn’t simply exercise it: “If the pope does have the power to release anyone from purgatory, why in the name of love does he not abolish purgatory by letting everyone out?” Luther’s complaints also went to the Church’s justification for promoting contributions. He complained about “the revenues of all Christendom being sucked into this insatiable basilica” when there were much greater needs, including “living temples” and local churches. When a copy of Luther’s theses reached Rome, the pope, according to some accounts, said: “Luther is a drunken German. He will feel different when he is sober.” Nonetheless, the pope saw Luther as sufficiently threatening to appoint a new general of the Augustinian order in the hopes that the he would “smother the fire before it should become a conflagration.” Surprisingly, however, at the gathering of Luther’s chapter that year in Heidelberg Luther’s arguments met with enthusiasm among the younger Augustinians and mere head-shaking among the older attendees. On December 10, 1520, Martin Luther and some of his university supporters gathered at Wittenberg’s Elster gate where various theological works and documents from Rome were placed in a pile and lit on fire. Luther himself tossed the papal bull into the blaze . “Since they have burned my books, I burn theirs,” he said. With Luther in obvious defiance of his demand for recantation, Pope Leo excommunicated Luther on January 3, 1521. Managing the Luther case for Pope Leo was the papal nuncio, Aleander . In Aleander’s view, secular tribunals had no role to play. Luther had been found guilty of heresy, condemned by the Church, and the only job of secular authorities should be to carry out the Church’s decision. “The only competent judge is the pope,” Aleander wrote. When Luther’s Appeal to Caesar reached Emperor Charles V, he tore it up and trampled on it. Within a month, however, a more composed Charles V, concerned with the reaction of the German people if Luther were to be condemned without a hearing, reconsidered his decision. 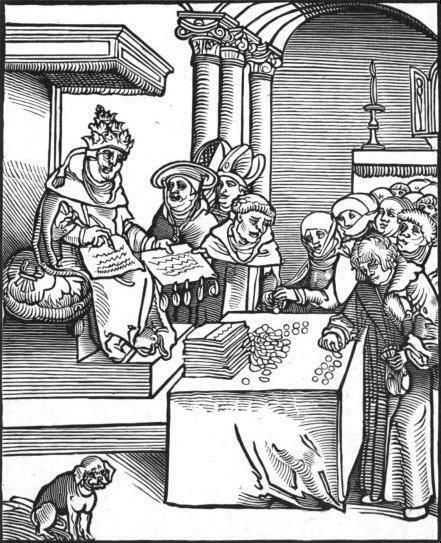 On March 11, 1521, the emperor sent to Luther an invitation to come to the Diet meeting at Worms to “answer with regard to your books and your teaching.” The emperor’s mandate promised safe-conduct if he would arrive in Worms within twenty-one days. “You have neither violence nor snares to fear,” the letter said.